The ICCS and IPIG* have identified patient populations at high risk for PNH. Download a toolkit that provides specific information about each of these high-risk groups. *IPIG = International PNH Interest Group. References: 1. Hillmen P, Lewis SM, Bessler M, et al. N Engl J Med. 1995;333:1253-1258. 2. Borowitz MJ, Craig FE, DiGiuseppe JA, et al; for Clinical Cytometry Society. Cytometry Part B. 2010;78B:211-230. 3. Richards SJ, Barnett D. Clin Lab Med. 2007;27:577-590. 4. Parker C, Omine M, Richards S, et al; for International PNH Interest Group. Blood. 2005;106:3699-3709. 5. Weitz I, Meyers G, Lamy T, et al. Cross-sectional validation study of patient-reported outcomes in patients with paroxysmal nocturnal haemoglobinuria. Intern Med J. 2013;43:298-307. 6. Movalia M, lllingworth A, Weitz I, et al. Poster presented at the 53rd Annual Meeting of the American Society of Hematology; December 10-13, 2011; San Diego, CA. Abstract 1033. 7. National Comprehensive Cancer Network. NCCN Clinical Practice Guidelines in Oncology: Myelodysplastic syndromes. Version 2.2014. http://www.nccn.org/professionals/physician_gls/pdf/mds. Accessed February 10, 2014. 8. Lee JW, Jang JH, Lee JH, et al. Haematologica.2010;95(s2):205-206. 9. Hill A, Kelly R, Hillmen P. Blood. 2013;121:4985-4996. 10. Mohanty BD, De Castro CM. Am J Med. 2012;125:243-245. 11. Urbano-Ispizua A, Schrezenmeier H, Brodsky R, et al. 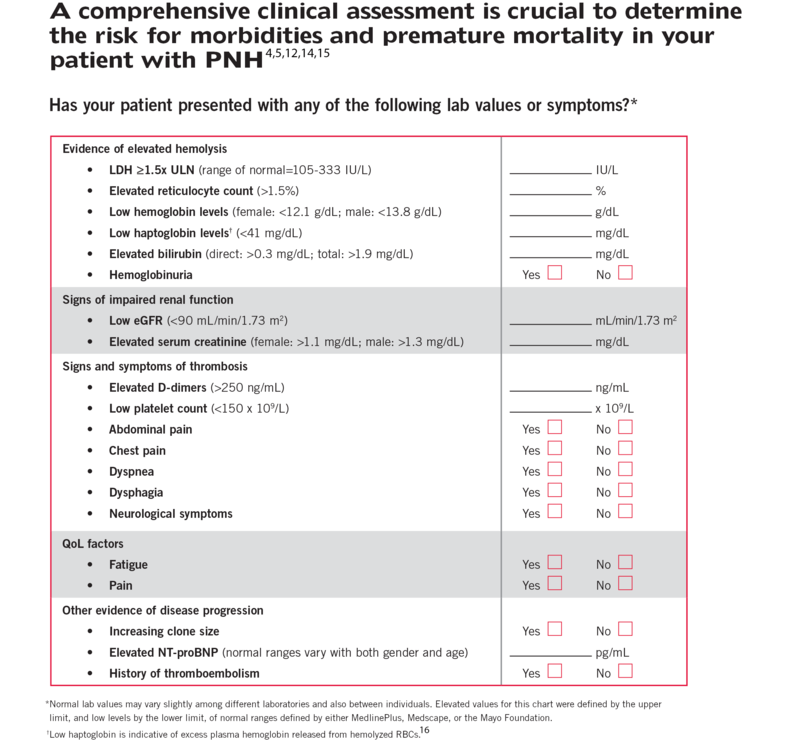 Evaluation of paroxysmal nocturnal hemoglobinuria disease burden in patients enrolled in the International PNH Registry. In: Abstracts of the 15th Congress of the European Hematology Association; June 10-13, 2010; Barcelona, Spain. Abstract 1022. 12. Hill A, Rother RP, Wang X, et al. Br J Haematol. 2010;149:414-425. 13. Meyers G, Weitz I, Lamy T, et al. Blood. 2007;110: Abstract 3683. 14. Nishimura J-I, Kanakura Y, Ware RE, et al. Medicine. 2004;83:193-207. 15. Hill A, Richards SJ, Hillmen P. Br J Haematol. 2007;137:181-192. 16. Rother RP, Bell L, Hillmen P, et al. The clinical sequelae of intravascular hemolysis and extracellular plasma hemoglobin: a novel mechanism of human disease. JAMA. 2005;293:1653-1662.